TL;DR: If you need a Heroku Jenkins Plugin that doesn't barf when you Set Properties, here you go. 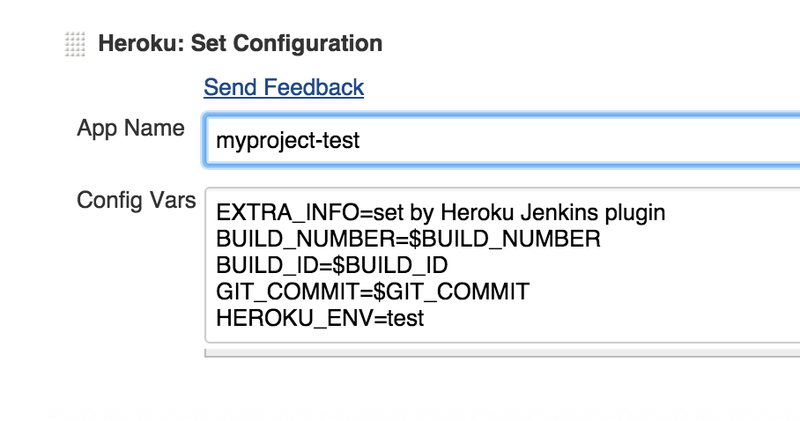 I'm extremely happy with my OpenShift-based Jenkins CI setup that deploys to Heroku. It really does do the business, and the price simply cannot be beaten. Too many times, at too many workplaces, I have faced the problem of trying to determine Is this the latest code? from "the front end". Determined not to have this problem in my own apps, I've been employing a couple of tricks for a few years now that give excellent traceability. The Jenkins Wiki has a really useful list of available properties which you can plunder to your heart's content. It's definitely well worth creating a health or build-info page that exposes these. 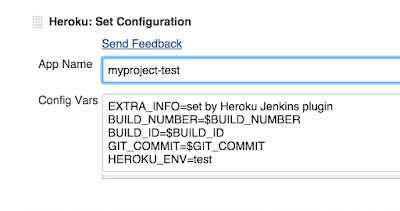 Although Heroku works spectacularly well with a simple git push, the Heroku Jenkins Plugin adds a couple of extra tricks that are very worthwhile, such as being able to place your app into/out-of "maintenance mode" - but the most pertinent here is the Heroku: Set Configuration build step. Adding this step to your build allows you to set any number of environment variables in the Heroku App that you are about to push to. You can imagine how useful this is when combined with the sbt-buildinfo plugin described above! Notice how I set HEROKU_ENV, which I then use in my app to determine whether key features (for example, Google Analytics) are enabled or not. Caused by: com.heroku.api.exception.ParseException: Unable to parse data. Effectively, it looks like Heroku has changed the structure of their pstable object, and that the baked-into-a-JAR definition of it (Map<String, String> in Java) will no longer work. But there are new tests to prove it, and a new Heroku Jenkins Plugin available here now. Grab this binary, and go to Manage Jenkins -> Manage Plugins -> Advanced -> Upload Plugin and drop it in. Reboot Jenkins, and you're all set.